Cherry and Spoon: My Experience as an Extra in the Coen Brothers' Movie "A Serious Man"
My Experience as an Extra in the Coen Brothers' Movie "A Serious Man"
In addition to theater, I’m also a big fan of movies (although I probably go live theater more often than I go to the movie theater). I’ve never had any desire to be an actor on stage or screen. But I’ve had a few opportunities to be an extra in movies, which was great fun for me because it gave me a behind-the-scenes look at how movies are made. It destroys a little of the movie magic, knowing what goes into them, but it’s worth it to watch great artists at work. I have Garrison Keillor to thank for my career as a movie extra. 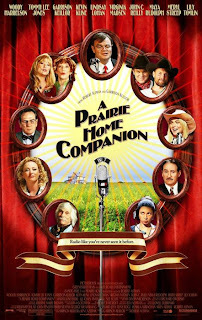 I’m a big fan of his radio program A Prairie Home Companion, so when I heard they needed bodies to fill the seats at the Fitzgerald Theater in St. Paul where they were filming a movie version of the show, I signed myself up! I got called in for a double shift, twelve hours that mostly consisted of reading The DaVinci Code in the waiting area across the street (it was 2005, everyone was reading it). An unpaid position except for a few bags of pretzels, and wearing my own clothes, it wasn’t very glamorous. But I did get to spend several hours sitting in the Fitz listening to Meryl Streep and Lily Tomlin sing together while Robert Altman called out directions from the back of the theater, John C. Reilly and Woody Harrelson goofed around on their guitars off-stage, and Kevin Kline wandered up and down the aisles. It was a good day’s (unpaid) work and well worth the time, even though I didn’t make it into the movie. The extras casting company for APHC, and for many local movies, is called “Three Crazy Ladies.” I got on their mailing list, which led to my next job as an extra a few months later. It was a small local movie that pretty much went directly to DVD. Which I bought, only to find out that my brief scene as the hostess of a bar/restaurant was cut. A few years went by and nothing interesting came up from the casting company. But then news broke that Joel and Ethan Coen were returning to their native Minnesota to film a movie, the first since Fargo in 1996. 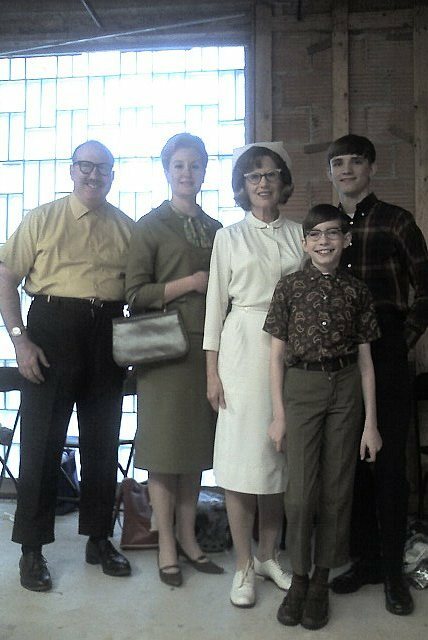 A Serious Man is period piece set in 1967 and many of the characters are based on people the brothers knew while growing up in Minnesota. I was desperate to be in it, and luckily Three Crazy Ladies again got the job and sent out an email calling for extras. I drove to a non-descript office building in Minneapolis and filled out a one-page application that included the question “are you willing to wear a bullet bra and girdle?” Since that was at the beginning of my obsession with the 1960s-set TV show Mad Men, my answer was an enthusiastic yes! (Trust me, it’s not as cool as it sounds.) Weeks went by and I heard nothing. Then one day I got a call and was asked, “Can you show up for a wardrobe fitting tomorrow?” Sure! I went back to the office building on a Friday morning and spent about two hours there with the wardrobe and hair departments. They had asked me to straighten my naturally curly hair, and when I got there they asked if they could cut it and do a shoulder length flip-do. I was reluctant, so I went with the other option: “We can give you an up-do and make you look older.” Sure, I’d love to look older. ;) Anything for the Coens. I tried on about four different outfits, all vintage clothes from the 60s. The wardrobe staff settled on a green suit – skirt and jacket – with a patterned blouse with a tie underneath. I was to be a “lady who lunched.” Once the outfit was chosen, they had to pick just the right accessories. It was like my grandmother’s attic – bins of earrings, shoes, and purses, all organized by color. 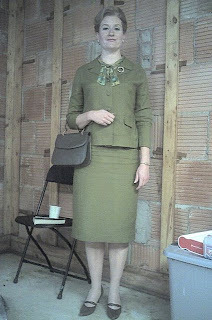 They found the perfect little brown heels (which actually show up in the movie, more about that later), a brown purse, gold and pearl clip-on earrings, and a pin to complete the look. I was so impressed with the level of detail that went into clothing an extra who would appear on screen for just a few seconds. That’s dedication and professionalism, my friends. I was given an updo and a few Polaroids were snapped of the look, and then I was on my way. 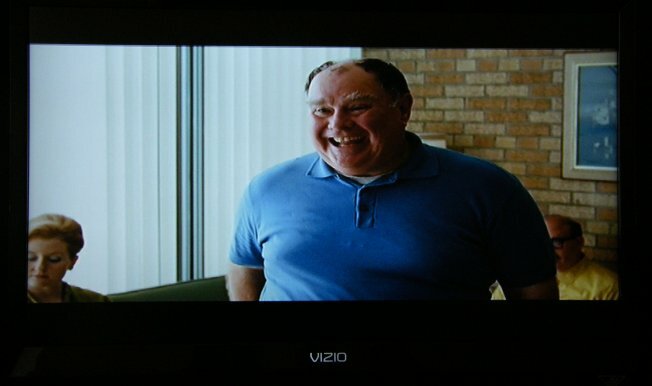 My scene was filmed on a Monday morning in October of 2008 in a furniture warehouse off 7th Street in St. Paul near the airport. It was a 6:30 am call time, and again I had to straighten my hair (so of course it was raining on and off and on all day). I showed up on set (which consisted of several trailers parked outside the warehouse) and partook of the free breakfast. There were six extras on the set that morning, and we were lead through the warehouse to the filming area. One room was set up as wardrobe, and our outfits were neatly tagged and ready for us. After wardrobe was make-up. I’ve never had my make-up professionally done, so it was a fun experience. I was given a mod 60s look – black eyeliner with a minty green shadow and pink frosty lip stick. Next stop (and the longest) – hair. While wardrobe and make-up were inside the warehouse, hair was a separate trailer outside. I spent at least an hour, if not two, in the hair trailer. First one set of rollers and then another, much teasing and backcombing, and more hairspray than I’ve used since I was a teenager, and I was transformed into a 1960s woman. 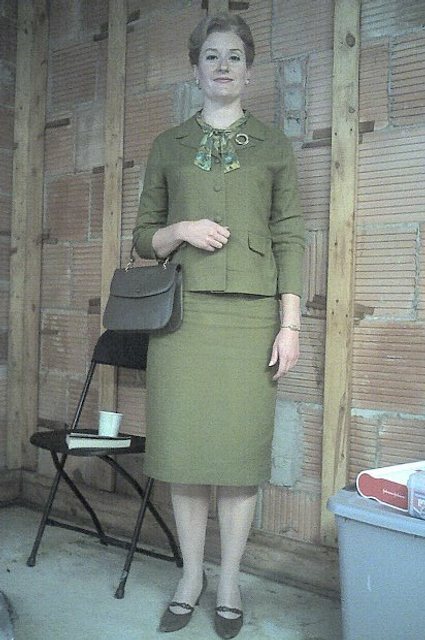 The other female extra was there too and was transformed into a perfect 1960s dental receptionist. The men didn’t take nearly as long. We were all ready to go and led to the waiting room, which also held snacks for the cast and crew. I think that was where I caught my first glimpse of Joel and Ethan. They would occasionally wander in to get a snack or read the paper, but as extras we’re told not to bother the stars or directors. Bad form to ask for an autograph on a movie set. 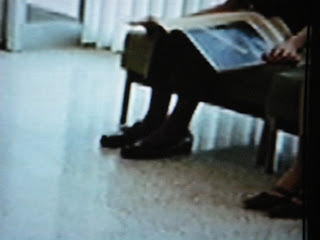 ;) I didn’t know much about the scene we were shooting, just that it took place in a dentist’s office. Finally, we were needed. Only four of the six extras ended up being used in the scene: myself, my 12-year-old “son” (whose uncle had gone to Hebrew School with one of the Coens), the receptionist, and another waiting patient (who, in real life, was a state representative that somehow helped with getting the movie made in Minnesota). The two “real” actors played the dentist and his patient. I recognized the patient as Wayne A. Evanson from several productions at the Guthrie; Dr. Sussman was played by Michael Tezla. The action of the scene consisted of the dentist walking out into the waiting area and greeting the patient, exchanging a few pleasantries. The specific dialogue didn’t seem to be important, just the tone of the exchange. It wasn’t until I saw the movie that I knew why – there was a voiceover during the scene so the dialogue couldn’t be heard. The scene was shot from four different angles, and I was involved in three of them. A close-up of each actor, and two from farther away with both of them in the shot. Not all the extras were needed for all shots, depending on the angle and who would show up in the shot. From each angle they did probably about ten takes. At times Joel or Ethan or both would come out to give direction, and it was seamless, like they were one person. They obviously have a great working relationship and shorthand between them. I don’t know of any other directors that work in a pair and have been so successful. One direction I remember specifically is that they wanted the patient to laugh with a big open mouth that they seemed to focus on. Their laughter indicated that they finally got what they wanted. We spent probably two hours filming what would be about a 10-second scene. Again, incredible attention to detail. Lunch break was called at about 1 pm and we went back outside to the food truck which had a great variety of fresh and tasty food. We ate with the crew under a big tent (it was still raining, so I had to be careful to protect my bouffant from the rain). I ate as much as my girdle would allow, which unfortunately was not a whole lot. We went back inside and got touch-ups on our hair and make-up. I felt like such a star as I was getting my hair sprayed and lipstick re-applied at the same time. As soon as we were ready to go, they came in and said, “We don’t need you anymore, you can go now.” Well, thanks for lunch! It was a fun and fascinating day on the movie set, and I got paid! But I had a long 6+ months to wait until I found out if I made it to the big screen. In the lower right-hand corner of the screen you can see my vintage brown heels, and my "son," who is reading a Look magazine from the 60s. I believe the article was something about the Kennedys. 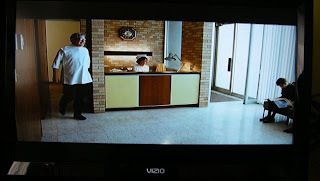 In the next scene you see the patient, and there's my head floating in the lower left-hand corner! During the filming of the scene someone (maybe an assistant director?) told my "son" what to do (pretend to read the magazine), which he took very seriously. But no one told me what I was supposed to be doing, so I just looked at the magazine over his shoulder and tried not to gawk at the main action of the scene. And that's it! My 15 minutes, OK 15 seconds, OK maybe 1/15 of a second, were over. It was such a fun experience to be even marginally involved in the making of a movie. And in my completely unbiased opinion, it's one of the Coen Brothers' best films. Definitely the most personal. 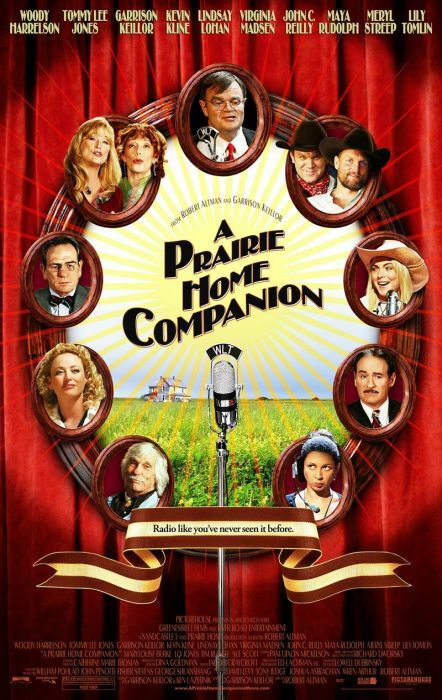 It has that quirky sense of humor that is uniquely Coen, but with a deeper meaning about faith and family and life. I'm proud to be a part of it.